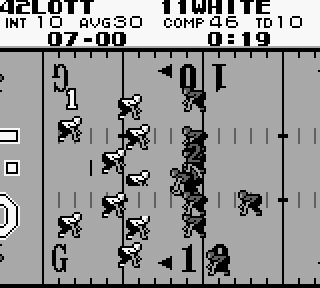 Tecmo Bowl and its sequel, Tecmo Super Bowl were big hits on the NES but somehow this Game Boy port flew under the radar. When I found this game in with a bunch of used cartridges at a local store, I had no idea that the game had ever been released but I knew that I needed to check it out. The game is a faithful reproduction of the home version, with minimal subtractions. The digitized speech (“ready, down, hut, hut, hut!” and “Touchdown!”) have been removed, but the sound effects and music remain the same. The playbook is also the same as is the selection of teams. The animations following touchdowns have also been brought over, and all of the players’ names are still there. The game runs slightly slower, which may be the reason that I have an easier time milking more yards out of my plays. Not only does Tecmo Bowl use the same password system as its big brother, it uses the same codes! That means that you can start a season on your NES and work on it on your Game Boy as needed. How many games back then let you do that? This game reminds me of how jealous I was of the Turbo Express handheld console, which allowed its owners to play their TurboGrafx games on the go. It’s too bad that more games didn’t take their cue from this one and allow players to take their NES games with them. Even though it’s just a sports title, Tecmo Bowl is impressive if only for its achievement in re-creating the home experience on a handheld. While the graphics and sound effects are nothing to write home about, their consistency with the NES release must have really made gamers back in the day feel like they were getting a quality product, which they definitely were. Buy Tecmo Bowl on GameGavel or Amazon. Tagged 1991, Football, Game Boy, Gameboy, Nintendo, Review, Sports, Tecmo, Tecmo Bowl. Bookmark the permalink.